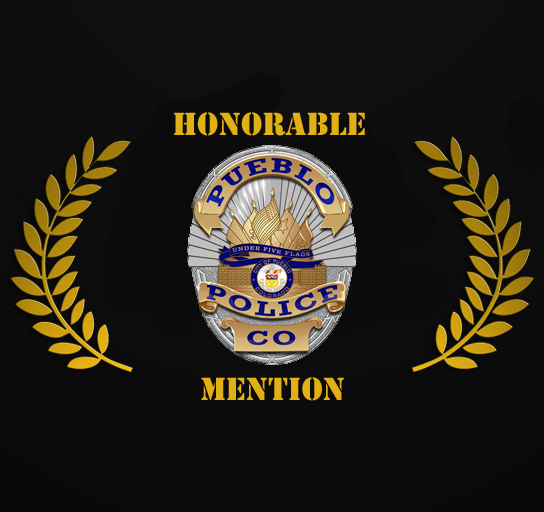 Pueblo Police Officer Barbara Dyleski went out of her way to serve. She was able to reach out to a man (Christopher) who was homeless on the streets of Pueblo and was able to make contact with his family in Kentucky. Christopher has been homeless and an alcoholic for years. Officer Dyleski had been working with Christopher for a while as he would entrust what money he had to her so he would not spend it. Officer Dyleski worked hard in collecting donations to help Christopher return home and worked with area service providers such as Posada to secure him a bus ticket back to Kentucky. She went above and beyond by helping the man purchase some new clothes as well as getting him a shave and a haircut for his journey home. Officer Dyleski even gave Christopher a ride to the bus station and waited with him until the bus left. Christopher was appreciative and stated he plans to better himself and his life. Officer Dyleski is to be commended for her dedication to "Serve" individuals in our community. We are proud of her and her actions. ⇐Previous Homicide Investigation in the 900 Block of Alexander Cir.